You don't have to be a fighter to train like one, at Alchemy MMA in Setauket & Smithtown you can get involved in one of the fastest growing sports available. Mixed Martial Arts combines the best aspects of mulitple fighting disciplines to create one truly devastating fighting style. 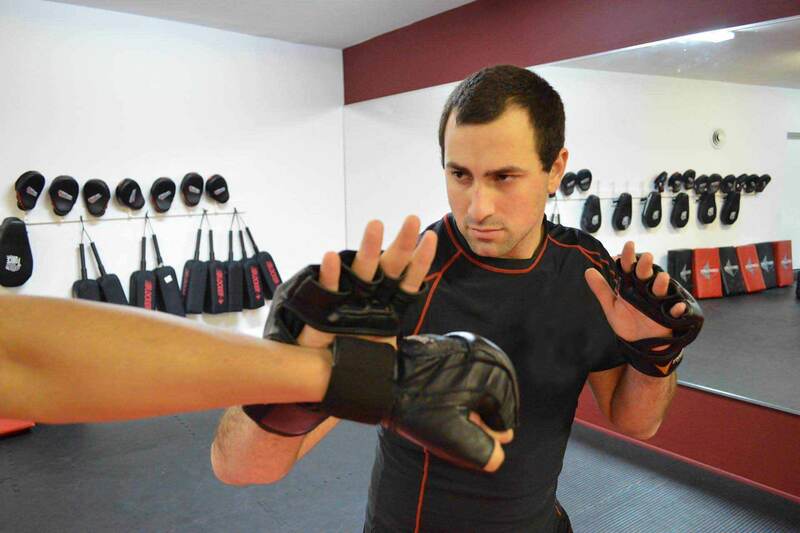 WHY TRAIN MIXED MARTIAL ARTS AT ALCHEMY? The benefits of training in just one martial art can have outstanding effects physically and mentally on a person. However, training in mixed martial arts gives you the chance to experience all of the best parts of many different martial arts. As we have discussed, there are four ways of fighting; kicking, hand striking, takedowns and grappling on the ground. Many martial arts are limited in the areas that they cover. Wrestlers only deal with takedowns, boxers only strike and Tae Kwan Do fighters predominantly kick. They are all truly effective at what they are designed to do but by combining them together we are able to fill in the holes and train overall well rounded fighters. Kempo is a very fast paced striking style that uses efficient strikes to multiple vital areas of the body in rapid succession to incapacitate its opponents. It has earned its title in the octagon as one of the leading standup martial art style thanks to UFC hall of famer, Chuck Lidell. He is famous for his elusive footwork and takedown defense which allowed him to stay on his feet as well as avoid being hit. Also his use of powerful strikes, more well-known is his overhand right, has accumulated him 13 K.O.’s during his UFC career. All of these characteristics can be attributed to his roots as a 5th degree black belt in the Kempo system. As one of the oldest and most well known fighting styles worldwide, boxing’s roots can be traced as far back as ancient Egypt. Until the rise of UFC, boxing was the most popularly viewed fighting sport available and fighters from around the globe would compete in these intense bouts of strength, speed, reflex and endurance. Although Western Boxing limited its competitors to four basic close-fist strikes, a good boxer could use these moves to deliver devastating blows to their opponent and was never underestimated. Muay Thai is a combat sport from the Muay Martial Arts of Thailand that uses stand-up striking, along with various clinching techniques. This physical and mental discipline is known as "the art of eight limbs" because it is characterized by the combined use of fists, elbows, knees, shins and feet; as well as a good physical preparation, that makes a full-contact fighter very efficient. Today it is a popular fighting style among UFC fighters because of its powerful roundhouse kicks and devastating knee strikes. Most notably, former UFC middleweight champion, Anderson Silva is an expert black belt in Muay Thai Kickboxing. The roots of karate can be traced back to Okinawa in the 1400’s when the invading Shimazu Clan banned use of weapons. All people were forced to train in secret and develop an effective open-hand style of fighting using inconspicuous farm tools as weapons to repel the invaders. In modern times, the word “karate” has become synonymous with “martial arts,” due in part to the huge success of the Karate Kid films. However in reality, Karate has its own unique and powerful fighting style. Many devoted Karate practitioners undergo rigorous training to harden their bodies to absorb blows, and to deliver powerful punches and kicks. Former UFC Light Heavyweight champion, Lyoto Machida was able to use his skills in Shotokan Karate to make a name for himself in the octagon. Developed in 1882 by master Jigoro Kano, it quickly became one of Japan’s most competitive sports. Fighters would compete to see which could pin the other using a throw or takedown, or subdue their opponent with a joint lock or choke. Judo’s efforts are predominantly focused on excellent takedowns as well as takedown defense. A famous Judoka and UFC champ, Ronda Rousey has used her Judo skills to takedown and submit many of her opponents in the UFC by armbar alone. Wrestling is one of the most ancient combat sports today dating back to ancient Greek Pankration fights. Fighters use various grappling skills and takedowns to put their opponent on the ground and finish them with a pin or joint lock. As a fighter today, this is the most crucial background needed to survive in the ring or any street fight. Regardless of one’s standup fighting capabilities if you get taken down to the ground all of those skills can end up going to waste. Wrestler’s overall make excellent fighters, most notably right now is UFC middleweight champion Chris Weidman. A NCAA Division 1 wrestler, he earned his title by defeating Anderson Silva one of the most legendary fighters to ever enter the UFC. He continues to fight making his hometown of Long Island proud! Mixed Martial Arts, or MMA as it has been popularly named, dates back far beyond the debut of the UFC (Ultimate Fighting Championship) in 1993. Fighters have been testing their skills against one another since the beginning of time. The most notable and first truly recorded MMA style event dates back to ancient Greece. Here fighters competed in competition’s called Pankration, a sport that joined the Olympics of ancient Greece in 648 B.C. The term Pankration comes from the Greek words “Pan” and “Kratos” roughly translating to “all powers.” After that point, martial arts began spreading to many countries throughout Asia. Famous martial arts styles such as Kung Fu, Karate, Judo and Tae Kwan Do began to develop as the need for effective self-defense styles became more and more necessary. From this point on, hundreds of matches between various martial arts styles began growing in popularity: competitions to see whose art was truly superior. Masters throughout history would challenge each other to defend the honor of their particular fighting style. In 1887 Heavyweight Boxing Champion, John L. Sullivan fought Greco-Roman wrestling Champion, William Muldoon; this fight helped solidify the idea that even a great stand up fighter has much to fear from a fighter with excellent wrestling or grappling skills, proving that each style had its own benefits and disadvantages. Competitions like this continued until the next major event in MMA history: a Kodokan Judo Master by the name of Mitsuyo Maeda, taught the art of Judo to Carlos Gracie in 1914. This was very unusual as the Japanese usually kept their arts of Judo and Jujutsu hidden and private. The breach of protocol allowed Carlos Gracie to emerge as the father of the now internationally recognized, Brazilian Jiu Jitsu. Carlos Gracie passed this knowledge on to his youngest brother Helio Gracie, the smallest of the Gracie brothers, who then refined the art into the BJJ, style we know today. Due to his smaller frame and body size, Helio Gracie developed BJJ to use body weight and leverage rather than brute force, to submit or move your opponent. The resulting fighting style allowed fighters of all sizes to compete effectively with a variety of techniques; and led to a string of Vale Tudo fights in the early 1920’s where fighting styles such as Brazilian Jiu Jitsu, wrestling and even Capoeira were present. All of these events led up to the first UFC on November 12, 1993. The original event was a one day tournament that pitted eight fighters of different martial arts origins against each other. Among the founders of the UFC was Helio Gracie’s son, Rorion Gracie; his goal was to bring Gracie jiu jitsu (BJJ) to America and prove its superiority in fighting. The roster was as follows: Royce Gracie (Brazilian Jiu Jitsu) Zane Frazier (Karate) Ken Shamrock (Shoot Fighting) Telia Tuli (Sumo) Gerard Gordeau (Savate) Kevin Rosier (Kickboxing) Patrick Smith (Kickboxing) Art Jimmerson (Boxing) These matches had very few limitations, and were ended by either submission or knockout. There were no weight classes or time limits. The idea was simple: two men enter one man leaves. In a landslide victory, Royce Gracie won three matches by submission in under five minutes. From this point on, UFC pay per views became a regular event. Various martial arts competed in realistic bare knuckle fighting competitions where head-butts, groin shots and even hair pulling were all legal. Due to the lack of structure or rules, Senator John McCain pushed to have the fights banned. During this time, the PRIDE Championships gained a huge following in Japan, allowing many UFC fighters the opportunity to continue fighting overseas. This continued until 2001 when Frank and Lorenzo Fertitta bought the UFC under the newly formed parent company Zuffa. After appointing Dana White as president and instilling some new rules into the fights UFC began to re-emerge and it was more popular than ever. In 2005, UFC launched their reality show “The Ultimate Fighter”, which allowed potential new fighters to enter the scene and train under great fighters such as Randy Couture or Chuck Lidell. The fighters would all live in a house together and have various competitions as the season went on. The winner would be awarded a six figure contract in the UFC. Many fighters have rose to greatness this way such as Forest Griffin after defeating Stephan Bonnar in season one of “The Ultimate Fighter”. From this point on MMA and the UFC became unstoppable forces. According to Joe Rogan, martial arts as a whole, has grown more since the inception of the UFC then the entire history of martial arts put together. It is one of the most-watched sports in the country and is still growing, with no signs of slowing down.